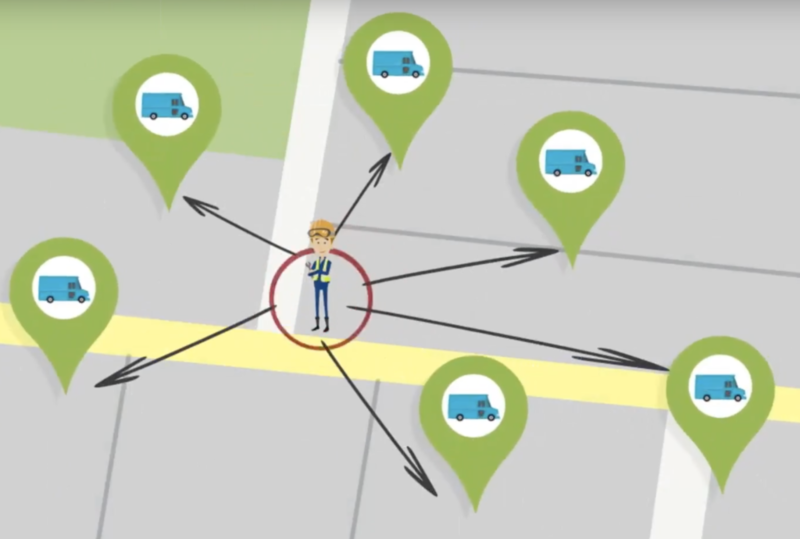 GPS Vehicle Tracking and Geofencing - What's All the Buzz? One of the most wonderful inventions of our generation is navigation by Global Positioning Satellite — GPS. If you drive a GPS-enabled vehicle, you can use it to guide you to any destination. If you run a service business, you can use GPS vehicle tracking to tell you at all times exactly where each of your service technicians is in the field. Let’s take a look at how GPS vehicle tracking works and how service businesses are using it today to streamline their businesses, become more efficient, and make more money. GPS vehicle tracking is an essential part of the field service management software you use to automate your business. FieldSurf, one of the leading field service management systems in use today in the home service business, has GPS vehicle tracking built right into it. The GPS vehicle tracking capabilities of FieldSurf let you track all your field technicians on a map in real time. You always know where all your technicians are at all times. FieldSurf ‘s GPS Vehicle Tracking Major Features – Tech Tracker and Geofencing. With FieldSurf’s Tech Tracker feature, everyone in your company always knows at all times exactly where each of your field technicians is at any time. FieldSurf produces a map of your field of operations, and the presence of each of your technicians’ vehicles is indicated on the map. Your technicians use FieldSurf as the time-clock, logging in to each job location on arrival and logging out upon completion of the assignment. This also acts as a payroll calculator, and you know at any time exactly how much payroll you owe to each technician in any pay period. When a new service call comes into your Dispatcher, your dispatcher needs to determine which technician to send to that location. A quick glance at FieldSurf’s GPS map will show your dispatcher exactly where everyone is. In real time. And he can then dispatch the nearest available technician. But GPS vehicle tracking goes way beyond the dispatching function. Let’s say you need to contact one of your technicians in the field. Before GPS vehicle tracking was available, how would you be able to determine where your technician is at the present moment? You used to have to call him on his cell phone. But what if he’s working under the customer’s house or something, and he can’t take the call? Or he’s completed the job and is now at Starbucks having a break, going to the bathroom, and drinking a cup of coffee while talking to his wife on the phone. Getting hold of him could sometimes be hard. And sometimes take a long time. Today, with GPS vehicle tracking capabilities built right into FieldSurf, all a manager has to do is access FieldSurf and he can tell exactly where everyone is. Using FieldSurf, any field technician can be alerted by SMS messaging that he should call the office, or that the customer is delayed and won’t be at the location for another thirty minutes, or you need someone to go by your regular supply house and pick up a part urgently needed by another technician. With GPS vehicle tracking, everyone in your home service business is on the same page. Your dispatchers and schedulers can all access FieldSurf at any time and locate any tech in the field. Supervisors and management can locate any field tech at any time to ask or answer any questions. FieldSurf has another incredible feature to work with its Tech Tracker to optimize GPS vehicle tracking: it’s called “Geofencing”. This allows you to draw virtual boundaries along real physical boundaries. Using FieldSurf’s geofencing, the system can be set up to inform you — or anyone in your company — when one of your field technicians has left Beverly Hills and has crossed into West Hollywood. Not only will you be able to see in real time the exact current location of each of your technician’s vehicles, but you can arrange to be notified by SMS messaging when such events occur. GPS vehicle tracking is only one of the many wonderful features of FieldSurf. When you start using FieldSurf, you will be able to automate every aspect and function of your service business. Your Scheduling and Dispatch function become entirely automated, reducing or totally eliminating errors like double-booking or sending your technician to the wrong address. FieldSurf automates your Inventory control, letting you keep track of every item in your warehouse and alerting you when you run low on any item so you can reorder before you run out and lose sales because you’re out or product. And FieldSurf totally automates your entire accounting department. With FieldSurf, you or anyone in your company that you authorize can have access to any of your financial reports any time you need them. You don’t need to ask your accounting people to generate financial reports. You or anyone else can instantly generate your financial reports so you always know where you stand at all times. FieldSurf will tell you your sales for any period, compare those sales figures with those of any other period. FieldSurf will tell you which jobs are open and which have been closed. It will tell you which accounts have been paid and which have not. All this information is generated for you instantly and in real time. Your reports will even reflect sales made that very day. No more waiting to know what’s going on. So if you’re looking to make your service business more efficient, look into deploying field service management software to streamline and automate your business. And make sure that the system you are looking into is the best system for GPS vehicle tracking, and make sure that it is built right in to your field service management software, rather than use a dedicated GPS vehicle tracking system that doesn’t have all the other management features that FieldSurf has and doesn’t integrate seamlessly with all your other systems.